I’m drinking tea…lots of it. Not just any tea but after a trip to Singapore couple of months ago and discovering TWG Tea, I’m sold. No more Red Bull Energy shots or the sinful 3 in I chai sugar laden lattes for this lazy girl. Afterall, in the spirit of the ceaselessly creative designers of haute couture, TWG Tea offers an aesthetes’ collection of unique and exclusive seasonal tea blends that reflect the core of TWG Tea’s global expansion and cosmopolitan appeal….sounds totally up my street! Distinguishing itself from the archives of cultural tea traditions, the world’s finest luxury tea brand is constantly conceiving and shaping the trends of this new era with creations that are sensual, irreplaceable and exceptional. Challenging and inventive, TWG Tea defies history in the crafting of its myriad collections, each more provocative and alluring than the last. 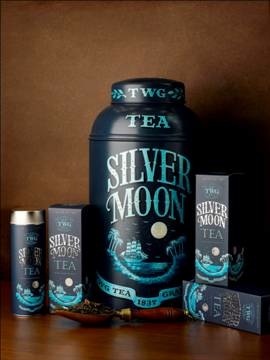 TWG Tea Haute Couture tea collection was first launched in Singapore with the signature Silver Moon Tea. A grand green tea bouquet that represents the ultra-modernity of this cosmopolitan city, this tea has become one of the most popular blends ever launched by the brand. The Haute Couture tea collections are a selection alluding to indelible memories of marvellous flavours. The collection includes some of my favourites…..look out for the flavours below if you are tea connoisseur looking for any excuse to have a cuppa.